Version 2 launched in 2003. This version had the first virtual museum as well as a staff news blog. The first post was Sunday, January 12, 2003, welcoming people to the site. Posts were intermittent but the last post on this version was Wednesday, May 9, 2012, announcing the passing of former Reservation Director Ed Human. Version 3–the current version–went live in August 2012 after two years of background work. The “Staff News” blog welcomed visitors on August 26, 2012. A “Photo of the week” series started the following month, which turned into “From the Archives” on November 18, 2012. VirtualBoxwell then joined Facebook in January 2013 and here we are. I explain all this to show that I’ve been trying to deliver Boxwell news and stories for over 20 years now. I’ve enjoyed every minute of it and have met some great people as a result of this work. Now, I’m asking you to give back. If every person who has “Liked” the VirtualBoxwell Facebook page since 2013 gave just $10 to the GoFundMe campaign, I would reach my goal immediately. If every person gave $20, I would reach the goal and be able to fund VirtualBoxwell and this work for years to come. If you’ve enjoyed what I’ve been doing here, if you want to see that complete history of 100 years of Boxwell, help me finish this work. Please, contribute to the GoFundMe campaign to transcribe the audio interviews I’ve conducted. Let’s complete this work together! 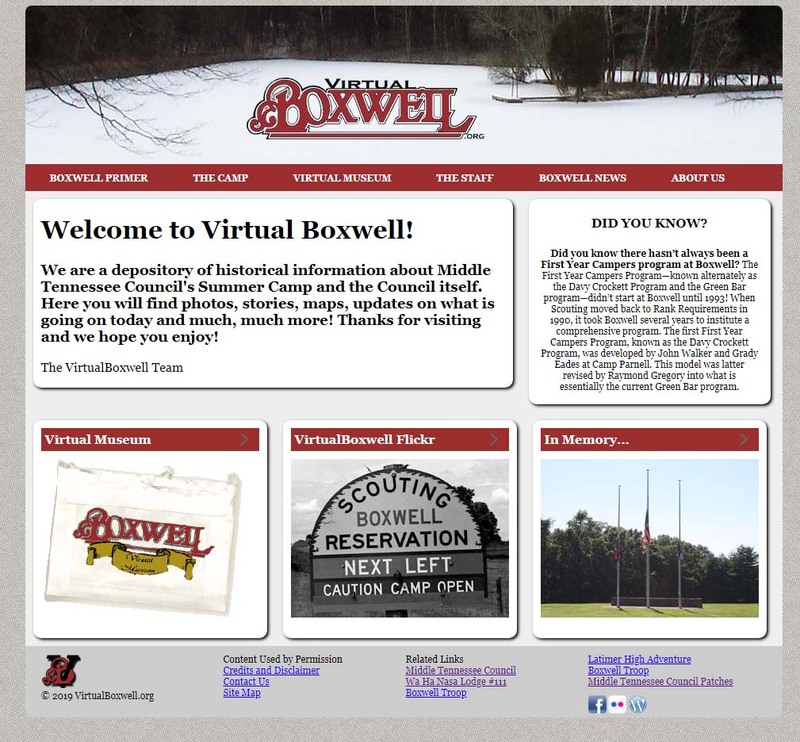 VirtualBoxwell.org version 1, designed by Chris Davis. 2001. VirtualBoxwell.org version 2, designed by Michael Eades. 2003. 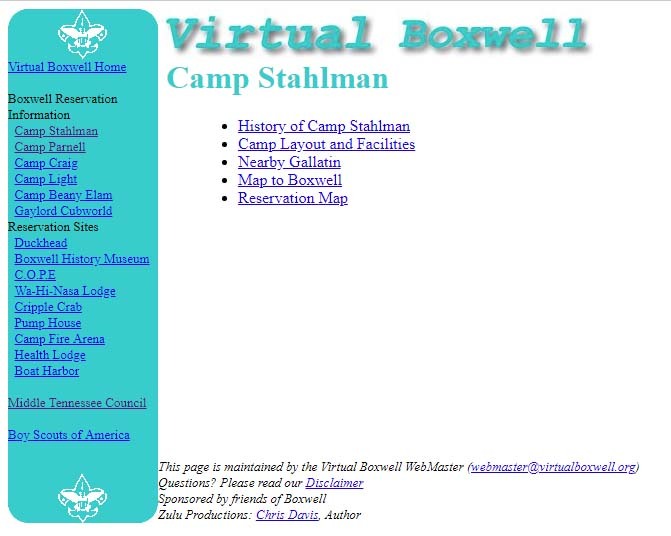 VirtualBoxwell.org version 3, designed by Grady Eades. 2012. For 20 years, staff still had a “Class B” uniform and it still required a Scouting related t-shirt. But this shirt was primarily a Boxwell t-shirt sold at the Trading Post. Older staff passed down their used t-shirts to new staff and new t-shirts were acquired as new designs became available. A free or discounted “starter” shirt was often given to new staff, but only one. None of these had “staff” on them. Thus, staff were essentially walking product advertisements for the Trading Post during the Willhite years. In 1997, the modern era of staff t-shirts began. New Reservation Director Ron Turpin introduced a simple shirt, seen here. On the breast of a heather grey t-shirt was a maroon eagle over the classic Chuck Creasy “Boxwell” logo (hmm… that looks familiar). For the first time, the back of the shirt said clearly “STAFF,” also in maroon letters. The modern staff shirt was born. Every year since has had a unique staff shirt design in addition to a unique staff hat. The first staff t-shirt of the modern era. 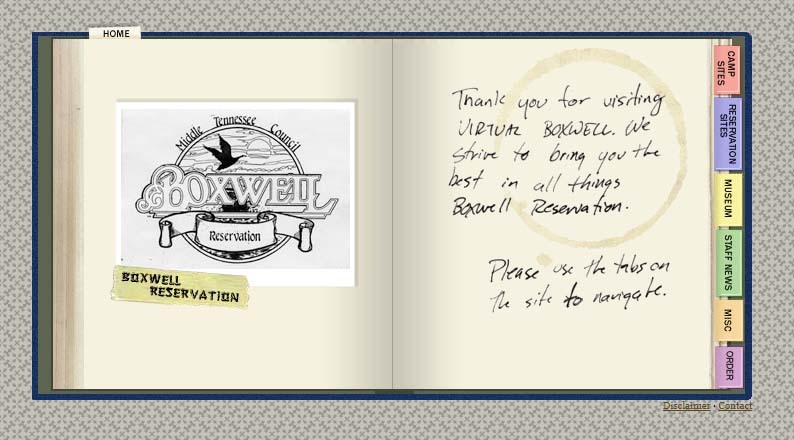 Would you be interested in seeing a complete written history of Boxwell for its centennial? If so, I need your help. I need to raise $6000 to take 100 hours of interviews to human transcription service. These services are fast and accurate, but tend to run about $1 a minute. It’s a big amount, but necessary to finish this story. In order to complete the book for 2021 centennial, I need these interviews transcribed this summer. I’ve exhausted every avenue I can think of, but none return transcripts with the accuracy and speed I need to complete the project on time. $6000 is a big request; are the interviews worth that amount? Yes. I have interviews with camp staff members and professional Scouters, past and present. 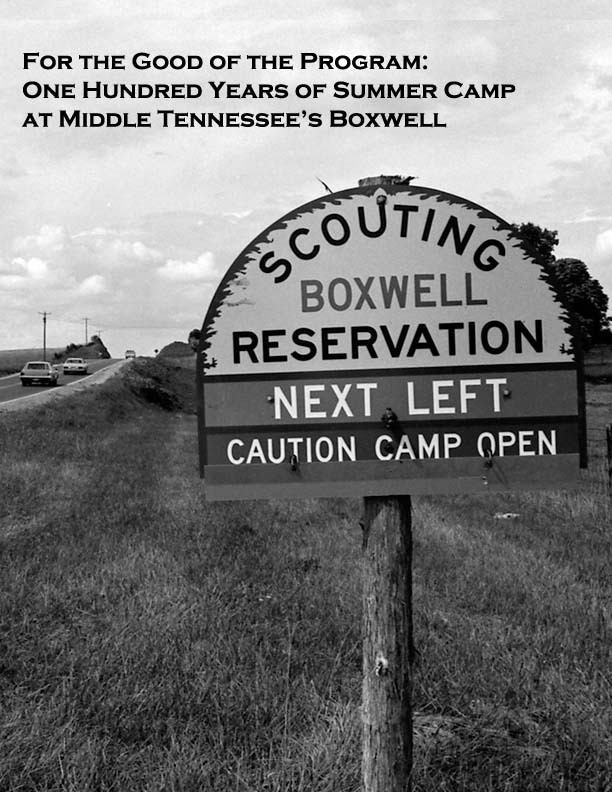 I have interviews with Scouts who attended Boxwell in the 1930s and 1940s and one when Boxwell integrated in the 1960s. I have conversations about Rock Island, the Old Hickory farm operations, life at Camp Murrey, and the capital development campaigns. And more stories on staff shenanigans than you can imagine. There is a story here that needs to be told, but I need your help to tell it. This fundraising campaign will be open until the end of May. From there, I will spend the rest of the summer getting these interviews transcribed and processed. I hope to have the entire history written by the end of summer 2020. Any amount you can contribute will help. Together we can create something people read for decades to come. Thanks for your help. 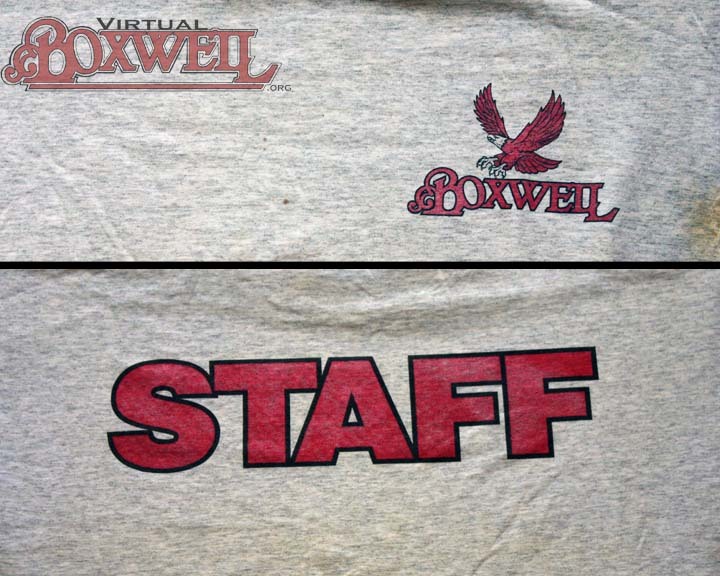 Our look at staff t-shirts continues this week with a look at the first staff t-shirts at the Old Hickory Boxwell. It is worth noting at the start that the new Reservation also brought with it new purchases. 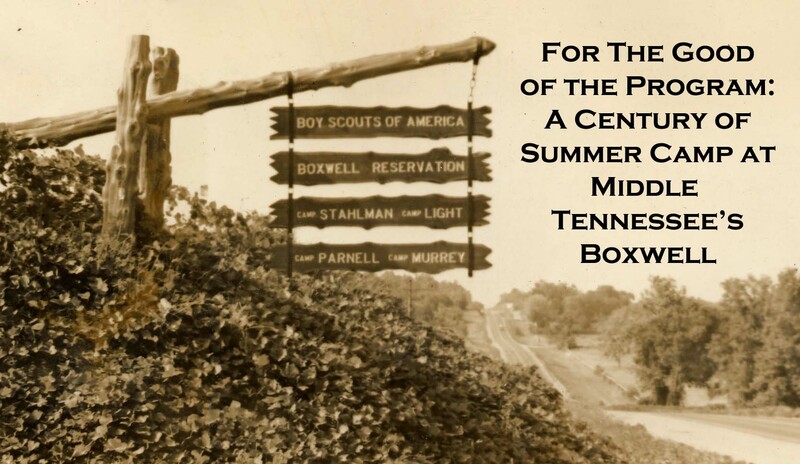 Unlike the other three Boxwells, at Old Hickory, Scouts could buy their own Boxwell t-shirts! 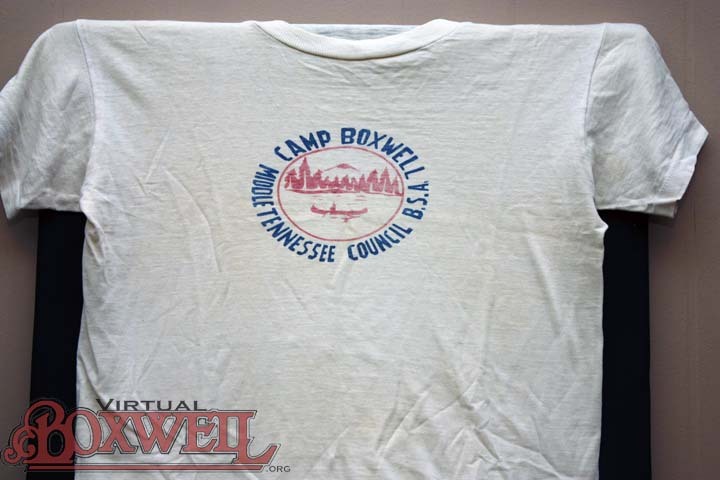 Thus, it shouldn’t be much of a surprise that the earliest Boxwell staff t-shirts did not say “staff.” A simple white shirt with a Boxwell map emblazoned on the chest, the shirt was very similar to the camp patch Scouts received at the end of the week. Both of course were based based off of the artist’s rendering of the Reservation used in 1959 Capital Development Campaign Development Fund booklet. The original art is framed and hanging in the Health Lodge. The original version was as pictured below: map and “Boxwell Reservation” above with “Middle Tenn. Council, B.S.A.” below. As time went on, there were minor variations on this design, mostly at the collar and sleeves. A version appeared with a red collar and another version came along with a blue collar and a blue ring on the sleeves. There was also a version with the map shrunk and just on the left breast. Eventually, there was even a version that said “Staff” above the map. Finally, a true staff t-shirt. In the photo, the several versions are showcased. Greg Tucker (left) is wearing the original version of the shirt at the 1983 Reunion. In the center, Reservation Director Ed Human wears the blue collared version “breast-map” in the early 1970s. And to the right, Floyd “Q-ball” Pearce wears the final version that actually says “Staff” in an undated photo. 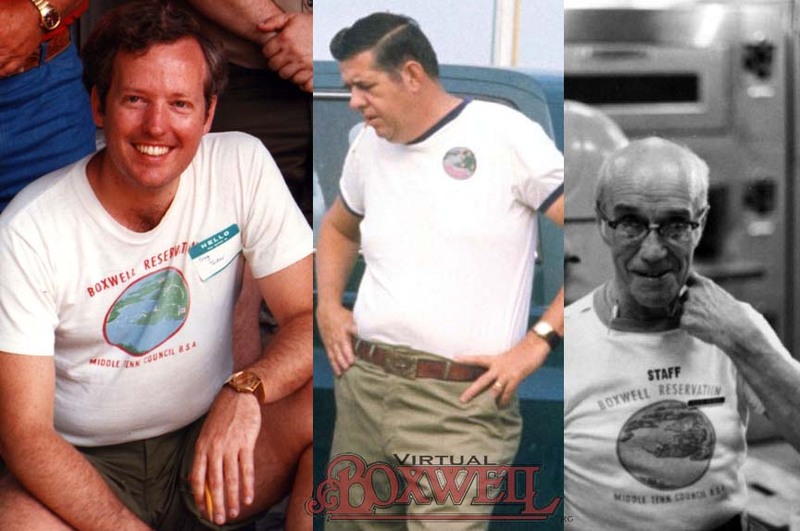 It’s time to look at Boxwell t-shirts! Obviously, there have been quite a few of them, so we can’t possibly cover all of the shirts ever produced. However, we’re going to spend April looking at some popular Boxwell t-shirts over the decades. This week’s t-shirt is the oldest Boxwell t-shirt we know of. This was the Staff t-shirt of Bob Alley when he worked on the Rock Island Boxwell staff in the 1950s. Clearly, there isn’t anything particularly special about the shirt. However, in a period before staff hats, a staff t-shirt was an easy to delineate Scouts from Staff. “Staff” isn’t printed on the shirt anywhere, so how are we certain the shirt was a staff t-shirt. First, the Rock Island Commissary didn’t sell t-shirts and clothing like modern Trading Posts do. Second, Bob Alley told us it was a staff t-shirt. That seemed pretty definitive.